An overwhelming 68% of Swedish people polled in a survey have stated that they are not on board with a cashless future. The survey was commissioned by Bankomat AB, an ATM chain company from Sweden created in cooperation between a number of banks in September 2010. Over 2,000 people aged 18-65 were polled over telephone interviews between January 23rd-February 3rd 2018. Among the 18 to 29-year-old participants, a majority of 56% declared that they still want keep cash. Among the 65-year-olds polled, 85% said they still want to keep cash. Only one in every four Swedish people would support a cashless nation. The results beg the question, is Sweden on the forefront of going cashless because of popular demand or because of central bank interests? The Riksbank head has proposed that the law should change so that banks are obliged to handle cash – in Sweden, it is often the case that they do not. Views on cash expressed in the survey varied significantly between those in small towns and those in large cities. The proportion of cash advocates was lowest in capital Stockholm, and highest in Västmanland, Värmland and Kalmar counties. 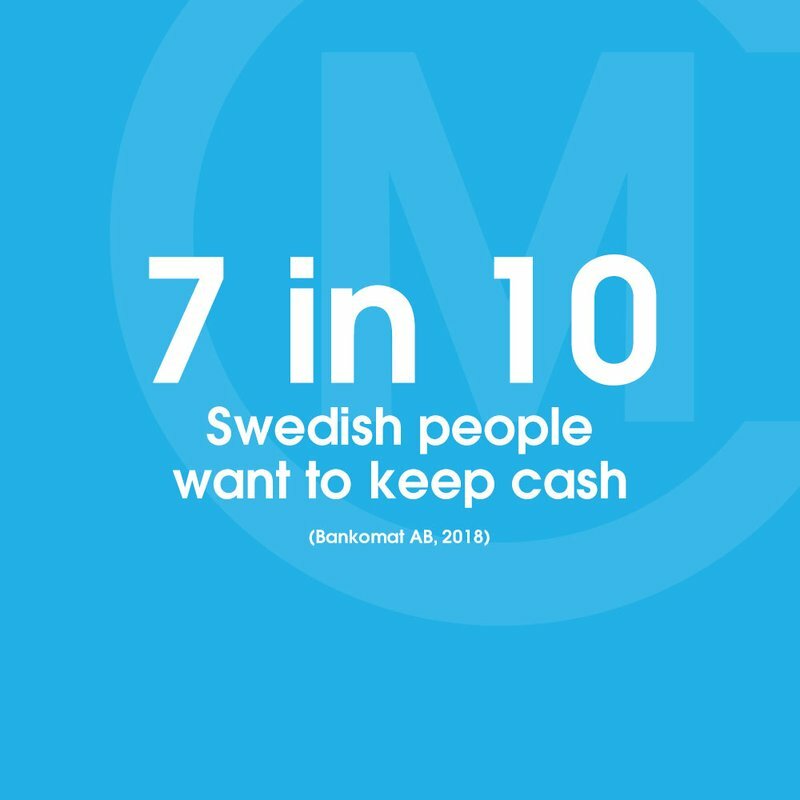 Approximately 68 percent of Swedes want cash to remain a payment option in the future, compared with 25 percent who want a completely cashless society, according to results of a survey commissioned by Bankomat AB. The remaining 7 percent of respondents said either that they didn't know or that they found the question too difficult to decide. "More and more people choose to pay digitally, but it is still an overwhelming majority who also wants to keep cash as a payment method,"
When asked, "Do you want cash to be left as a possible way to pay even in the future, or do you want a completely cashless society?" Sixty-eight percent answered, "I want cash to be left as a possible way to pay." Press Release. 'Sju av tio vill ha kvar kontanter'. Bankomat AB. Electronically published March 19, 2018. Accessed March 24, 2018. Survey conducted by Sifoundersökningen. 'Sju av tio vill ha kvar kontanter!' Commissioned by Bankomat AB. Interviews conducted January 23-February 03, 2018. Accessed March 26, 2018. ATM Market Place. '7 in 10 Swedes want to retain cash as payment option.' Electronically published March 20, 2018. Accessed March 23, 2018. The Local. 'Most Swedes don't want country to go cash free: poll.' Electronically published March 19, 2018. Accessed March 23, 2018. Going cashless was once a dream for Sweden, but experts now warn it could quickly turn into a nightmare for the Scandinavian country... Sweden may put the brakes on its dash to do away with cash after warnings that all-digital transactions would hurt the elderly and the poor. When it comes to abandoning cash, Sweden is going it mostly alone. While cash in circulation in the Nordic region’s largest economy has dropped rapidly in recent years, the amount of notes and coins has risen in most of the rest of the developed world since the global financial crisis, according to a report from the Bank for International Settlements. Björn Eriksson - one of Sweden's best-known cash champions and civil servants - published a pro-cash white paper in 2014 titled Korten på bordet (Cards on the Table). The impact of the document trickled through the Cash Debate ever since, but it wasn't translated into English until Currency Research got on the case.